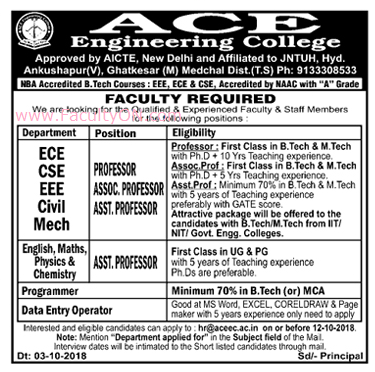 ACE Engineering College, Hyderabad has advertised in the DECCAN CHRONICLE newspaper for the recruitment of Teaching Faculty- Professor / Associate Professor / Assistant Professor Plus Non-Faculty jobs vacancies. Interested and eligible job aspirants are requested to apply on or before 12th October 2018. Check out further more details below. College Profile: ACE Engineering College is the brain child of “ACE Engineering Academy” the leading institute in Hyderabad in coaching prospective Engineering graduates for GATE [Graduate Aptitude Test in Engineering] for admissions in M.E./M.Tech/MS in IISc, Bangalore and various IITs/NITs and various universities. Assistant Professor (Engineering)- Minimum 70 % marks in B.Tech & M.Tech + 5 years of experience. GATE score is preferred. Assistant Professor (Non-Engineering)- First class in UG & PG + 5 years of experience. Ph.D is preferred. How to Apply: Interested and eligible candidates are requested to send CV along with copies of certificates and recent PP size photographs to the following email address. Mention the post applied for and department in the subject line of email.